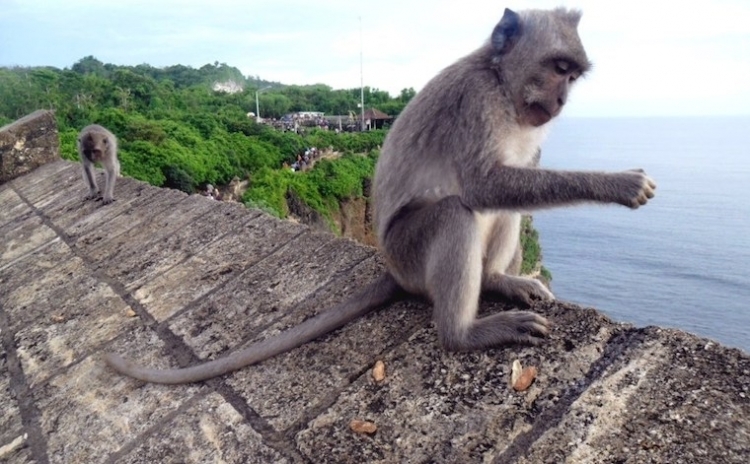 My last blog ended with my return from Uluwatu Beach. I had enjoyed a fantastic afternoon and was a bit pooped. 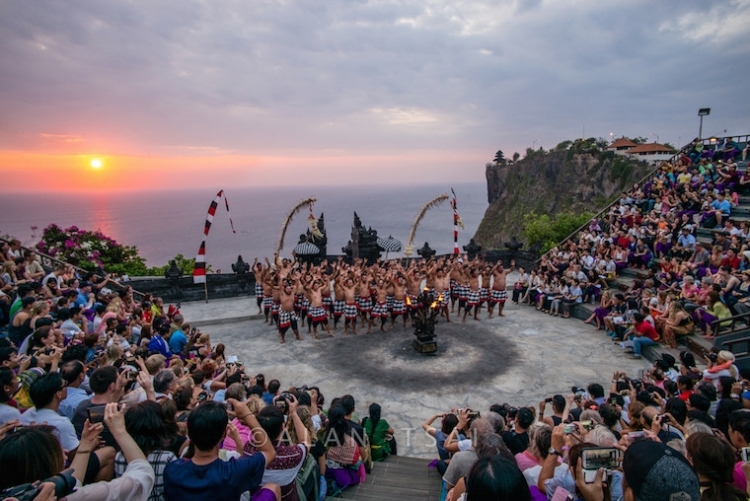 Normally, I would have called it a day but since I was leaving Uluwatu the next day, I had to go out again to see Pura Luhur Uluwatu ( the temple at Uluwatu) and the Kecak Fire Dance. From what I had read, the temple is best seen at sunset and conveniently, that is when the dance starts. So off I went, on the back of a motorcycle, clinging for dear life to the driver who was an employee of the homestay. I have a pretty good imagination which was working overtime. My mind was vividly envisioning various scenarios all involving my body hurtling through space. The traffic is crazy here. Drivers, cars and motorbikes alike, don’t seem to observe any rules except one ….. squeeze in there first! There were times when I just had to close my eyes and trust. And of course, we arrived unscathed. I headed towards the temple but you must first walk the walk of fear! Monkey territory! Now, if you ever look up the temple online, the one warning that is repeated over and over is the one about the monkeys; how they will grab anything you haven’t duck taped to your body, how they have rabies and will bite you and you will die an agonizingly slow death, how they will swarm you and in some cases, strip your clothes off, take your glasses, cell phone, camera ……. anything that sparkles or is brightly coloured. Seriously, you should read some of these posts. So, being the dyed in the wool wuss that I am, I was pretty nervous about walking down that path. And of course, when I got there, the nearest people were miles ahead of me, leaving me to blaze the trail solo …. a sure bet for calamity. No way I was going first …. no way, no how! So I let a family from India go first, scheming that the monkeys would be all over those brightly coloured saris and I could slip by in the melee. And guess what! I counted 8 monkeys! The dear little things were minding their own business and totally ignoring the saris and me. Tho, I did see one rather large male chowing down on a pair of shocking- pink flip flops! 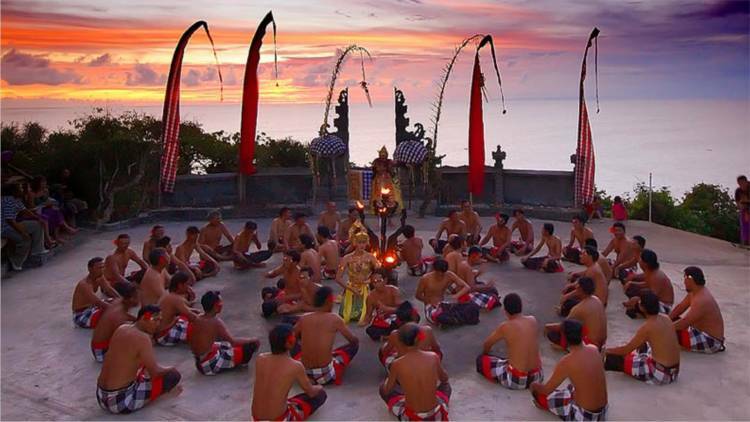 There is some interesting information about temples in Bali. A temple here is called a Pura. The inner temple has no walls to allow the Balinese Gods, who reside above Mount Agung to visit during festive occasions at which time they enter through the open spaces. The temples are also enclosed by walls. Pura in Sanskrit means “space surrounded by a wall“. Balinese temples are separated into 3 sections. There is a front courtyard which contains the drum used to summon the villagers to work or to announce the presence of the gods and also the kitchen. Then there is the center courtyard which is used for a meeting hall as well as performances by the gamelan orchestra and for dances. And finally there is the inner temple where the gods will be found, when they are visiting, and it is here that offerings are made. To attend any ceremony,there are a few basic rules. One must wear a sarong and a sash, never walk in front of people praying and never sit or stand higher than the priest. 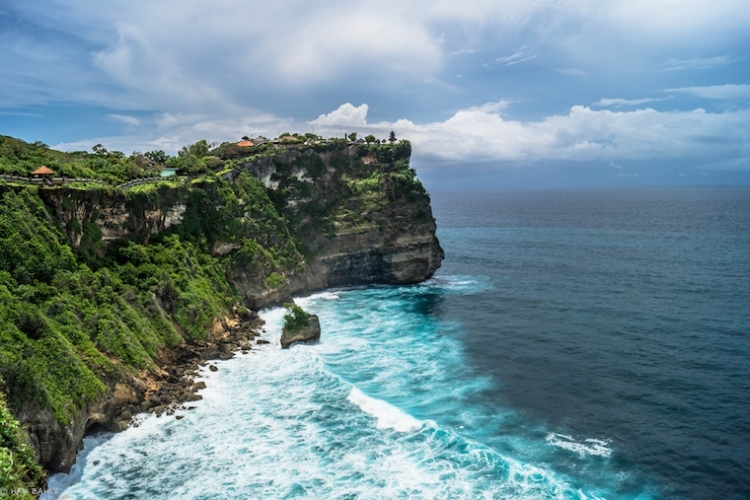 Pura Luhur is a thousand year old temple perched on a rock ledge 1000 ft above the Indian Ocean. The grounds are lovely and the site is awesome. The temple is best viewed from a distance as you can’t enter it. So, given that I had less than an hour remaining till show time, I headed to the Kecak dance area to get a good seat. The stands form a horseshoe around a centre area and in the distance, you can see the temple which will soon be silhouetted by the sunset. I’m glad I decided to go straight to the stands as it filled up quite quickly. There was a lovely Indonesian family in front of me and we ended up chatting to pass the time. And then they asked if they could take my picture. Hmmmm, second time that day. But sure, and can I take yours? Then the show started and it was great! The all male “choir“ came in chanting “Kecak, Kecak, Kecak.“ In fact, they basically repeated this chant at different intensities for the duration of the hour show. You would think that would get a bit much but no, I find myself replaying a short video I made just because it was so cool. Then the dancers come in, again all male, telling a story of a princess and her woes. I really loved it. The “fire“ part of the show is when bundles of brush are lit and the Monkey character dances around stomping the fire out. After the show ended, the performers stayed for photos with anyone who wanted. And yours truly lined up for a couple. Then it was time to head for the parking lot and find my motorcycle driver for my return to the homestay. What a great night! What a fantastic day! I love Bali! And I’ve only been here 2 days and I’m loving it! This is going to be a great trip!